SP100 was successfully added to your cart! SP100 could not be added as a favorite. Please make sure you are logged in. 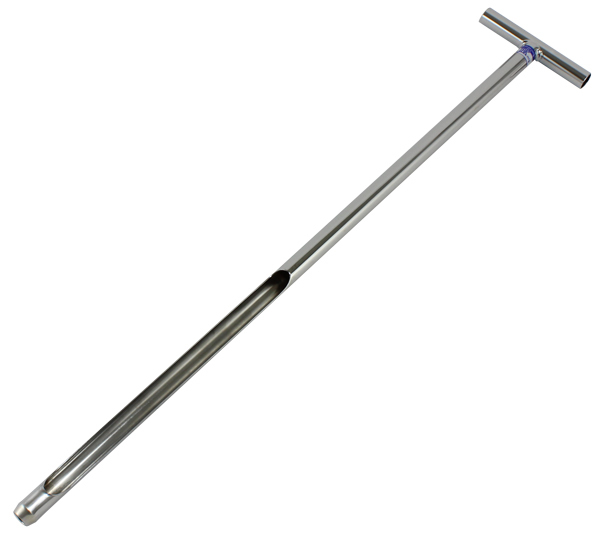 36" long soil sampler probe. Fabricated from steel tubing, electroplated with copper, then chromed. Corrosion resistant plus soil won't stick when the probe is pulled. Easily wipes clean for repeated sampling. Uniquely designed probe cup cuts a core slightly smaller than the diameter of the tube, enabling the core to rise in the tube without breakage as the probe is pushed into the soil. Tempered to tool steel hardness, the cutting edge won't bend if it strikes a hard object.